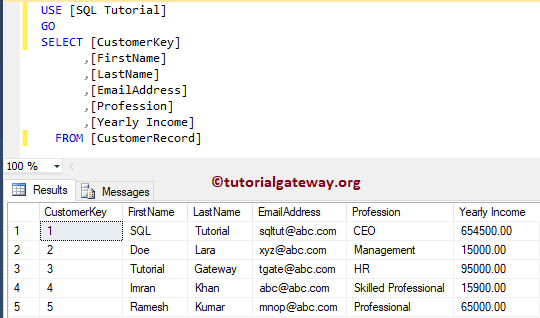 A Clustered Index in SQL Server defines the order in which data is physically stored in a table. It means, SQL cluster index will sort the records first and then store them. 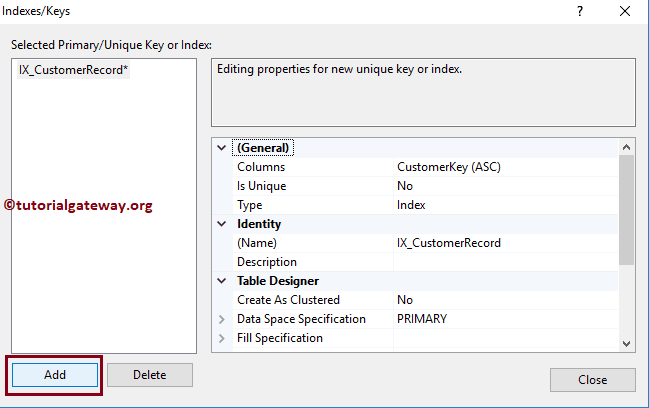 Generally, when you create Primary Key, the Clustered index will automatically created by that primary key. 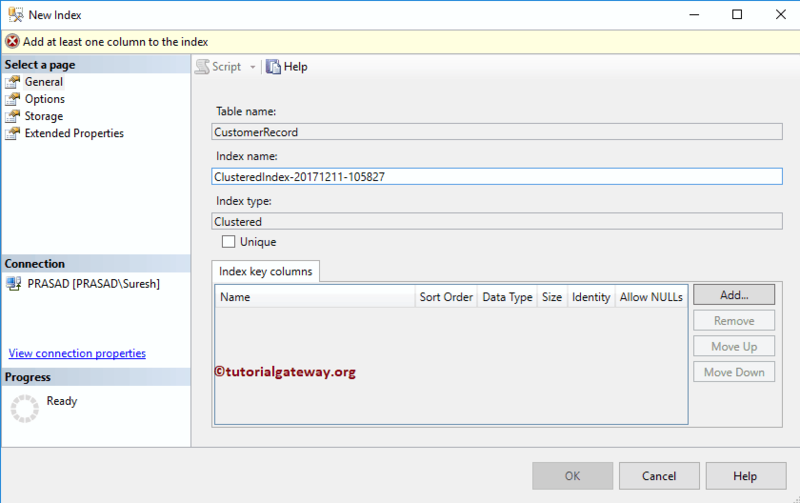 However, you can explicitly create cluster index in Sql Server using the CREATE CLUSTER INDEX statement. 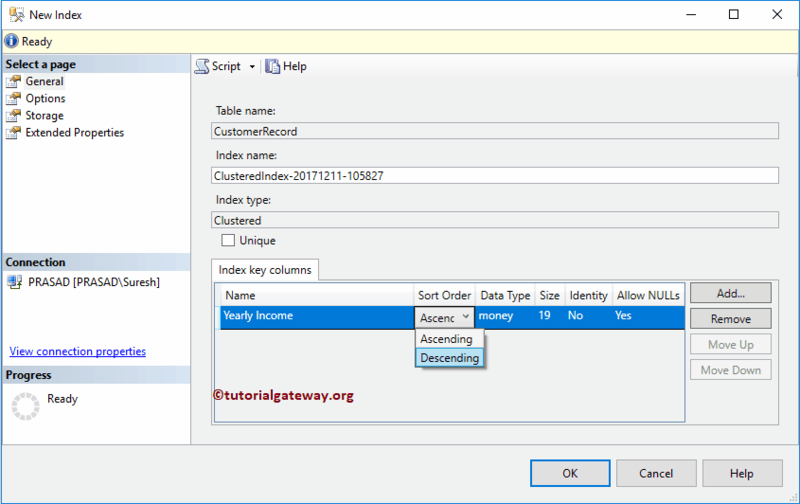 TIP : You can create only One SQL Cluster Index per Table. 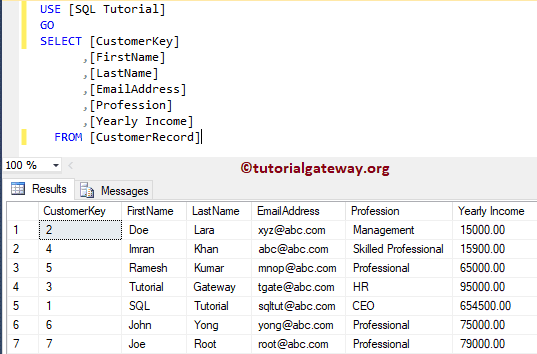 When you create Primary Key Constraint on a column then SQL will automatically create Clustered Index on that column for you. This will happen only if there is no existing Cluster in SQL table. 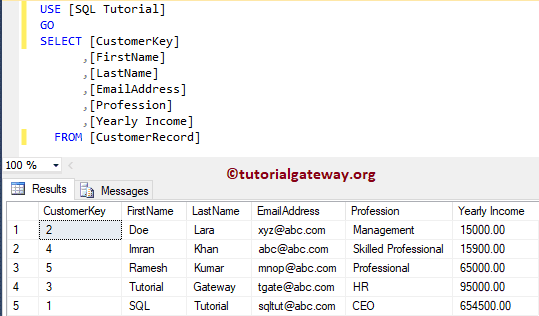 In this example we will show you, How to create Clustered Index in SQL using the Transact SQL statement. 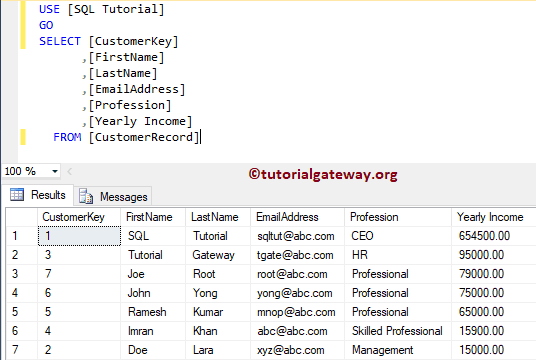 Here we will create a primary key at the time of table creation. 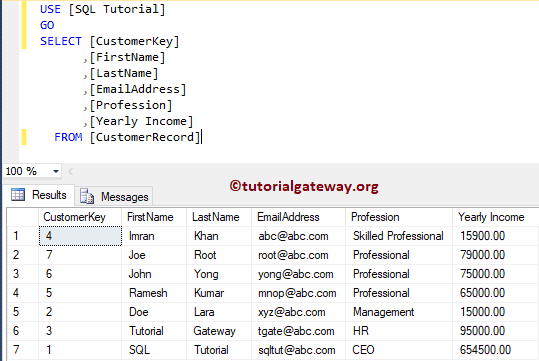 I Suggest you to refer Create Table article to understand the Create Table statement. 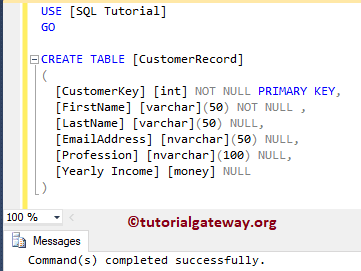 Let me use the sp_helpindex stored procedure to check the SQL index on CustomerRecord table. 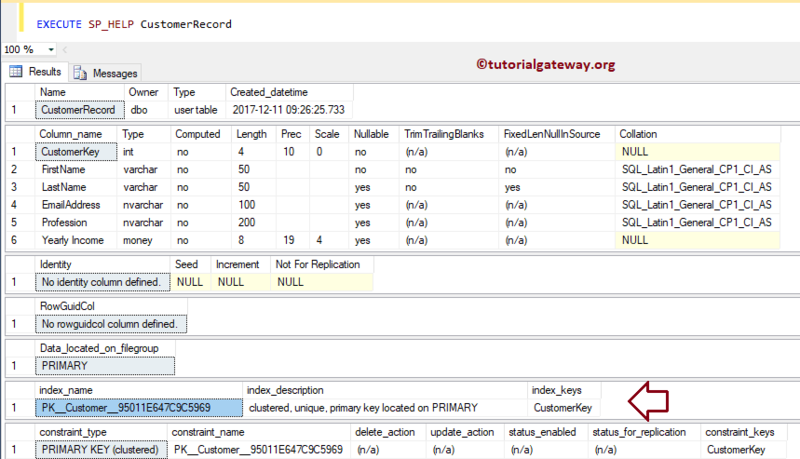 As you can see from the below screenshot, primary key had created a Clustered and Unique index on Customer Key column. 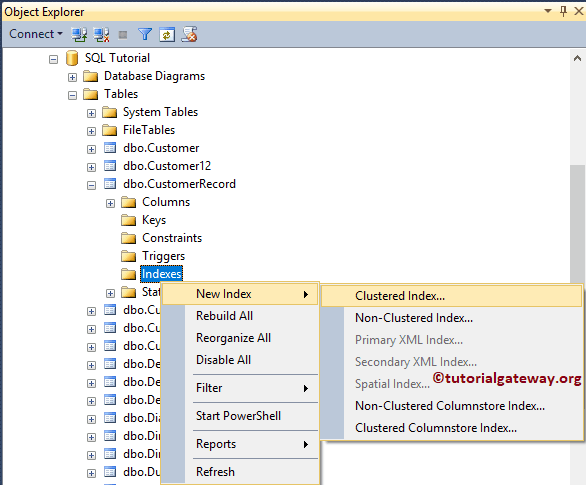 Let me insert few rows to check the SQL cluster Index functionality. As you can see we are inserting 5 records into the table, and the Customer Key values are not in any proper order. Let me Select the records that we inserted before. From the below screenshot you can see that, the records are sorted by Customer Key in Ascending Order. This is because, Sql server Clustered Index will reorder (rearrange) records. 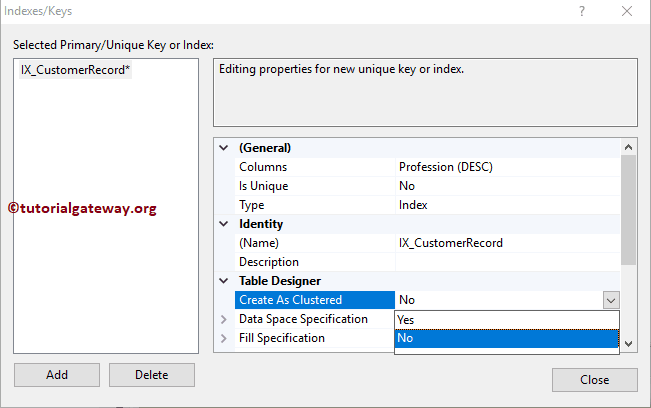 Here, our clustered Index is automatically created by the primary key so we can’t simply delete using this statement. But for explicitly created Clustered Index this will work. Once you select the Delete option, Delete Object window will be opened. Click OK to delete the Index. This time we created the Clustered Index explicitly So, let me try the DROP INDEX statement to delete this clustered index. Now you can see we successfully deleted the Sql Server clustered index using Drop Index statement. Now you can see, data is sorted by Professional in Ascending Order, and then by Yearly Income in descending order. 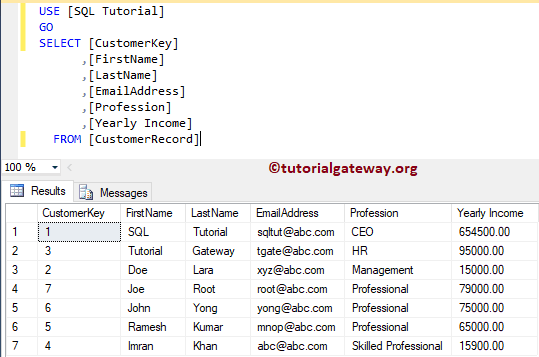 In this example we will show you, How to create a Clustered Index in Sql Server using the Management Studio. 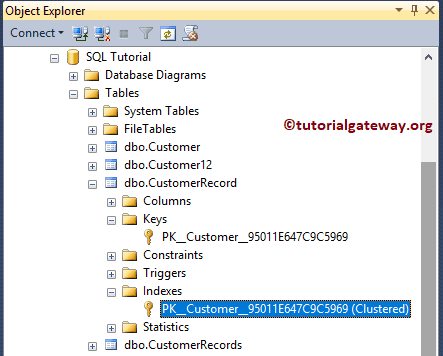 To do so, Please go to the Object Explorer and expand the Database folder in which the table had. 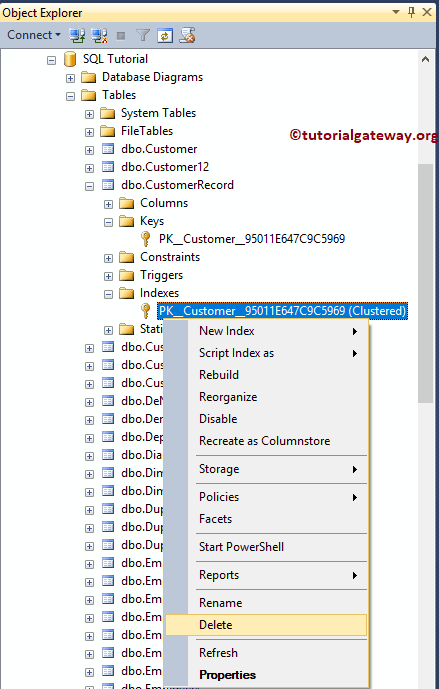 Click on the Add button, and select the column name on which you want to specify the Sql Server Clustered Index. For now, we are selecting the Yearly Income column. 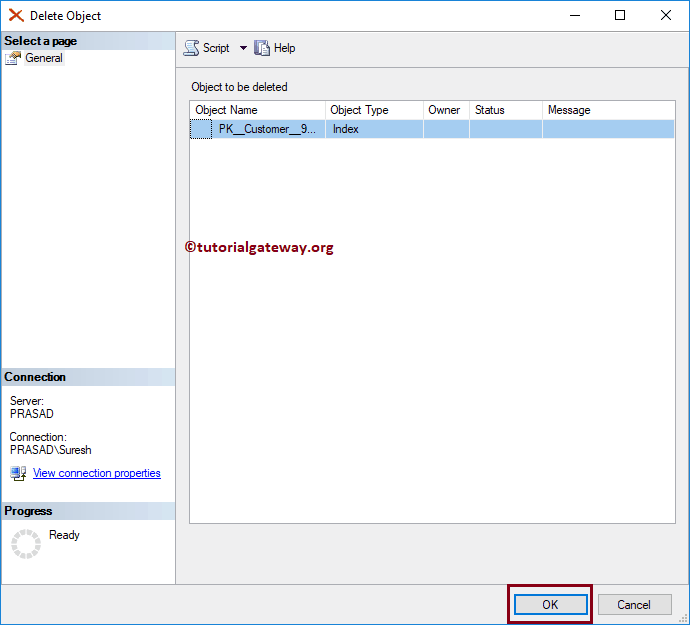 Please expand the table on which you want to create a Clustered Index in Sql Server Object explorer. Next, Right click on it will open the context menu. Please select Design option to open the table in Designer window. 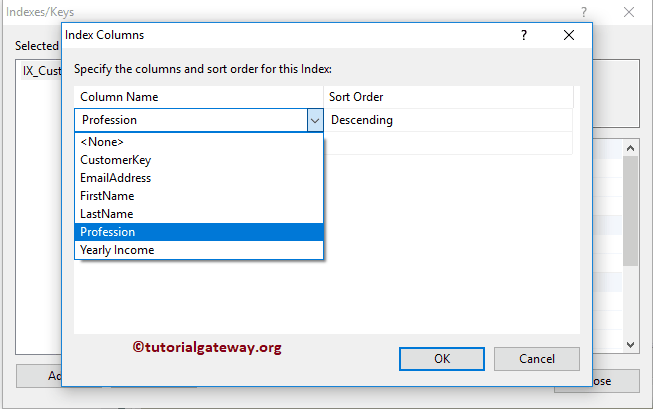 Next, Right click on the column will open the context menu. 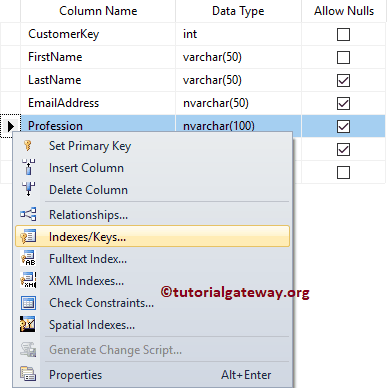 Please select the Set Indexes / Keys… option as we shown below. Please click on the Add button to add a Clustered Index. 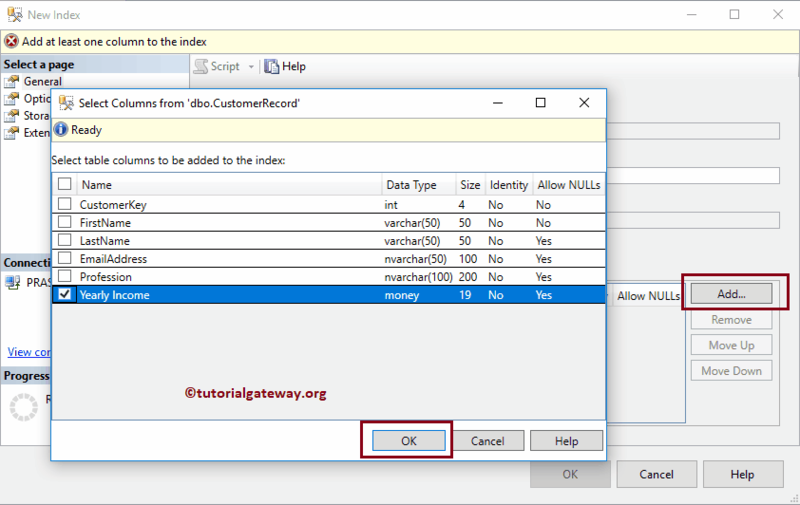 Once you select the Add option, SSMS will create an Index for you. That’s it! we created the SQL cluster index. Now you can see that the data is sorted by Income in descending order.